Jun 19 – 25 vs.
Jun 12 – 18 May 2016 vs.
Apr 2016 May 2016 vs.
Jun 19 – 25 – National average rates held steady for vans, reefers and flatbeds last week. An increase in the load-to-truck ratios for vans and reefers indicates that rates could rise this week, however, as the second quarter ends and a holiday weekend begins. What will you learn attending our dispatch seminar? We will provide information to successfully dispatch your clients truck(s). We list important business contacts, and provide information about laws and regulations as well as required documents. We describe how to provide excellent customer service, build successful business relationships and effectively manage time and stress. It explains freight volume and facts affecting load availability. 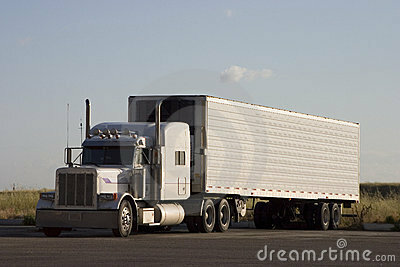 It guides you through the process of obtaining your own loads and dispatching your clients truck(s). And you also learn about proper freight handling and important delivery procedures. Finally, we will dispel myths and common misconceptions about the trucking industry, provide you with facts to disprove “truck stop” gossip, and make the process of dispatching transparent. Best of all, we will tell you the truth what you can really earn as an independent dispatcher. We will not give you an unrealistic number, like many of our competitors offer on their websites only to wheel you into their service scam. We came to the realization that these companies don’t care about your success, only their own success, meaning their own revenue. We offer continue support for our clients, even after the seminar has ended, anytime, no additional charge. One more advice, be aware when someone is telling you that you can charge a percentage of the load you are dispatching, you can’t, because you are not a broker and you don’t have a broker’s license. You don’t carry a $75,000 bond and you may be subject to all kinds of lawsuits when things go wrong. Van rates were still looking up last week. Lots of loads are heading from the Southeast into the Northeast, which changed prices going in and out. There are a lot of loads available in California. Here are some of last week’s hot spots, where rates changed the most. Northbound loads boosted the Charlotte market, which finally caught up to where it was before Memorial Day. 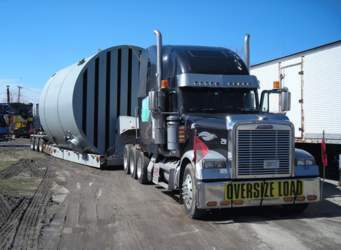 Since there are a lot of loads heading to the Northeast, it also means that a lot of trucks there are looking for loads out. That led to falling prices on a handful of lanes. Freight is still strong in Southern California. Columbus and Chicago have been on a big upswing this month but both stalled a bit last week. A bright spot was the lane from Columbus to Buffalo, which was up ▲17¢ to a strong $2.76/mile. No big rate changes outbound from Texas last week. Prices rose slightly in Houston and fell a little out of Dallas. See what other truckers got paid on the lanes you run by signing up for TruckersEdge Enhanced. You’ll see the average prices paid on more than 65,000 lanes, based on real transactions between brokers and carriers. Hire Right poll finds that 21% of truck drivers are leaving the industry due to health issues. 45% of respondents to Hire Right’s survey say they do not offer a wellness program at all. A recent survey of 3,500 human resources, recruiting, security, and management professionals by Hire Right found that “health issues” is the reason cited by 21% of truck drivers leaving the industry, with a further 41% saying they’re quitting the profession to spend more time at home. Kent Ferguson, director of transportation for Hire Right, told Fleet Owner that more transportation companies are recognizing the importance of the truck driver health issue and are doing more to address it. “We’re finding that wellness programs are becoming a popular retention tactic because of the median age of the driver workforce and the physical demands of the job, as it can be difficult to get proper rest, eat healthy and exercise while on the road,” he said. With the driver shortage expected to worsen this year, 59% of respondents reported finding, retaining and developing talent has become a top business challenge. Where “wellness programs” are concerned, some 35% of respondents offer safety and accident prevention programs, 21% offer free immunization/flu shots and 18% offer smoking cessation programs. Yet 45% of respondents said they do not offer a wellness program at all. Some 31% of respondents indicated a focus on dedicated operations for more home time. Another strategy being implemented to help drivers spend more time at home is load swapping which shortens the periods of time they spend on the road, Ferguson noted. Other tactics being used to attract and retain drivers are increased pay (51%), upgraded equipment (49%) and recognition/rewards programs (41%). To improve the “driver on-boarding” process, some 34% of respondents said they are creating longer orientation/training periods, with 32% appointing a driver liaison/mentor for their new drivers. Our truck dispatch manual and our truck dispatch course provides all the tools and information an independent Owner Operator or a home based dispatch service needs to successfully dispatch his or her own trucks, or his or her clients trucks. It explains how to set up your mobile office, lists important business contacts, and provides information about laws and regulations as well as required documents. It describes how to provide excellent customer service, build successful business relationships and effectively manage time and stress. It explains freight volume and facts affecting load availability. 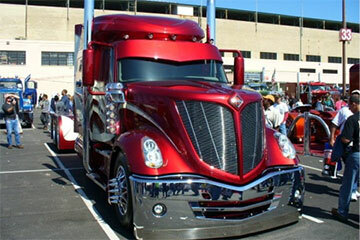 It guides you through the process of obtaining your own loads and dispatching your own truck or your clients trucks. And you also learn about proper freight handling and important delivery procedures. Finally, our publication and our dispatch course dispels myths and common misconceptions about the trucking industry, provides you with facts to disprove “truck stop” gossip, and makes the process of dispatching transparent. Every industry, trade, profession, and occupation has established business practices and ethical standards that set certain guidelines how business should be conducted. The primary purpose of these practices and standards is to establish trust among the industry to promote good business relationships and facilitate business transactions. 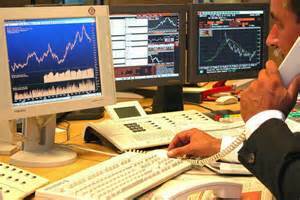 Therefore it is very important to pick the right load board and deal only with reputable brokerage firms. Our publication and our service will show you how to succeed and where to find the best paying loads from the brokerage companies with a 90+ credit rating. The U.S. Department of Transportation’s Federal Motor Carrier Safety Administration (FMCSA) today announced that it has awarded $32 million in financial assistance to 15 states to help ensure that foreign truck and bus drivers and vehicles involved in international commerce at or near border crossings with Canada and Mexico are properly licensed to operate on U.S. roads. The Border Enforcement Grant (BEG) program is a federal discretionary grant program focused on reducing crashes, fatalities, and injuries by drivers and vehicles involved in international commerce by ensuring that these motor carriers, drivers, and vehicles are in compliance with U.S. commercial vehicle safety regulations, including financial responsibility, operating authority, driver qualifications and licensing, and vehicle maintenance. The grants are awarded to state law enforcement agencies that share a border with Canada or Mexico and responsible for enforcing the Federal Motor Carrier Safety Regulations at the roadside. For further information on the FMCSA Border Enforcement Grant Program, visit the Border Enforcement Grant page. Jun 12 – 18 vs.
Jun 5 – 11 May 2016 vs.
Jun 12 – 18 – National average rates rose 2¢ per mile for reefers and flatbeds last week, but the average van rate was unchanged. Van traffic and rates increased for northbound loads leaving major Southeastern markets. Jun 5 – 11 vs.
May 29 – Jun 4 May 2016 vs.
Jun 5 – 11 – Load-to-truck ratios rose for all equipment types in the first full week after Memorial Day, which also included the annual Roadcheck inspection blitz. National average rates edged down 1¢ for vans last week, and reefer rates increased 1¢, following big gains in the previous week for both equipment types. May 29 – Jun 4 vs.
May 22 – 28 May 2016 vs.
May 29 – June 4 – Spot market rates continued their upward trend after Memorial Day. Last week was a 4-day work week, which would normally account for a 20% decline in load posts, but load availability was only down 9% last week. 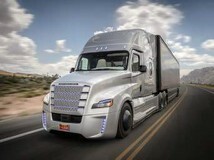 That led to higher load-to-truck ratios for vans, reefers, and flatbeds. May 22 – 28 vs.
May 15 – 21 Apr 2016 vs.
May 22- 28 – Van rates recovered 1¢ per mile last week, due to big rate increases on the highest-volume lanes. 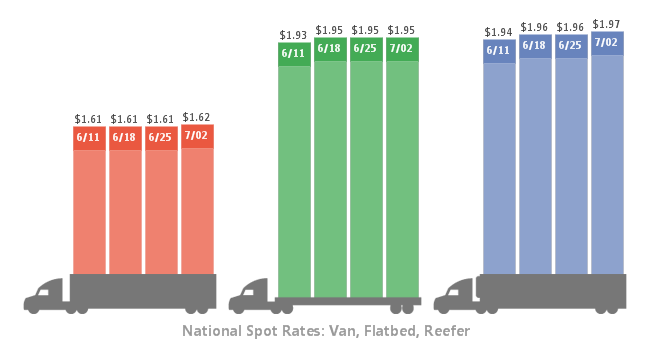 Flatbeds also added 1¢, but reefer rates were unchanged as a national average. The fuel surcharge also played a role, as diesel prices continue to climb.